Creepy Collections Story from yesterday. Got a call in the morning telling me that my Tata photon broadband bill was due today. The lady said, but then you will have to pay the overdue amount. So she says - 'I can somebody to collect the payment, when will you be back'. So she says - 'Okay, our guy will be there at 5 PM'. 5 PM, I was still out, so got another call. 'Sir, are you back'. I gave the address, and said - 'I'll eat my lunch and leave'. I was in the center of Chandigarh, and Tata's office that I dealt with was in Mohali, a fair distance. Crazy lady - I thought. However - In 5 MINUTES there was a guy outside the restaurant ready to collect the payment. I gave a cheque to be safe, and when the lady called again to confirm - I told her if we ever hire somebody for collections management, she'd be the first person we ask! Palolem, Patnem and Agonda are beautiful beaches in South Goa. There aren’t any big hotels here (apart from the 5 star Lalit Intercontinental in Rajbag), so the beaches are comparatively less crowded and have a lot of scenic beauty. Every year the beach shacks are setup from scratch and dismantled during the monsoons! That probably explains why Palolem is often rated the most beautiful beach in India. We had shortlisted a few places from Outlook Traveler, and Lonely Planet in south Goa – Cuba, Allessandra, Village Guest House, Sandy Feet, Ordo Sounsar, Bhakti Kutir, Dream Catcher, Ciaran’s Camp, White Sand, Sand and Waves and Agonda Paradise. Agonda is supposedly less crowded compared to Palolem, so we went here first. We debated going to Agonda via the coastal road from Assolna (which Lonely Planet said was one of the most beautiful roads in Goa). However, considering our already long route from central Goa, we decided to go on the highway (NH17). The asses were definitely grateful the next morning that another couple of hours riding were avoided, and the ride on NH17 was delightful. Agonda had a nice beach, with a lot of beach shacks but nothing stood out. Cuba was nice, and H20 looked nice as well. We highlighted these two on our list and proceeded to Palolem. In hindsight, if all you are looking for is some peace by the beach, it can’t get any better than Agonda. If you want a little action – Palolem is better. Palolem is a beautiful beach, we thought it was the prettiest beach in Goa. It has an island and a stream on one side, and a rocky bay on the other. It is crescent shaped with beautiful clear water and looked like a place right out of a dream. This is where the first 15 minutes of Bourne Supremacy were shot. It was a little crowded even though it was just about the end of season. The locals told us that there is hardly any place to step on the beach in December and January. Here in the end of March, it didn’t seem overwhelming. There were two places here that were on the top of my list - Dreamcatcher, which is about 100 metres off from the beach, and on the side of a stream, and Ciaran’s camp. Ciaran’s camp has the best reviews on TripAdvisor, and looked pretty good. We fell in love with Dreamcatcher though - it had something for everybody. Its laid back from the beach so you have your privacy, and the stream and the view of the island makes up for it. We stayed at the Honeymoon Suite, which has two floors including a balcony which overlooks the stream. The off season rate was just around Rs. 3500 per night, which is still expensive compared to the other beach shacks in Palolem which vary between 700 and 3000. It was definitely one of the most romantic places I have ever seen. The only downside is that there is one huge bathroom, with a bathtub, on the ground floor, and the bedroom is on the first floor, so I burnt a lot of calories running up and down in the three days we stayed here. The stunning thing about this place is that it is dismantled every year and built up from scratch. I think they should make it a national heritage site based on that fact alone! The restaurant is by the stream, overlooking the small hill and though I had a lot of restaurants on my list for Palolem, we were drawn back to it every day for its stunning views. This is the honeymoon suite – this fantastic structure is built from scratch every year! A nice walk down from Palolem and passing Colomb on the way is the Patnem beach. It is less crowded than Palolem and people seeking more privacy throng here. Its a beautiful beach too and looked great for surfing. The interesting thing about this beach is that there are hardly any Indians here. I guess Indians like staying in nice hotels, and I guess the heat wouldn’t be as inviting to most of us as it is to the Europeans. Here is a fantastic reference from Outlook Traveler about the beach shacks all over Goa – Small Vagator, Aswem, Morjim (All North Goa), Palolem, Agonda and Patnem. It has the rates and tariffs for each, though you will be able to negotiate your way a lot, from the website rates, during the off season. Goa’s beach shacks come of age. Here are some - both posh and not - that made the grade this season. Eating out in Goa can give somebody who has trouble making choices a head-ache. There are tens of thousands of restaurants, and standard of food varies widely. Considering the fact that an average vacation of 10 days would give you just about 20 restaurants to try – you have to be prepared to work hard and choose. I generally look up Tripadvisor restaurant reviews, Lonely Planet and Times food guide – in addition to word of mouth. This is often a project in itself that has to be meticulously planned if you are a foodie like me. Last time we were in Goa – we had the MapMyIndia GPS, Addresses from Restaurant websites and maps from Travel books to find our way to the restaurants. It felt like a tedious task considering we were always on a bike. So I made a note to self to make a Goa restaurants map. Here’s the first version for Candolim, Calangute and Baga. Britto’s on Baga beach for its atmosphere and sea food platters. There’s always a live band or Karaoke to keep you entertained while you wait for the food. Tibetian Kitchen for its spicy as hell sauces. If you get a long waiting at Souza Lobo, this is an excellent alternative a few steps away. Try the momos. Banyan Tree – This is a fantastic Thai restaurant inside the Taj Holiday Village Campus. The green curries and the salads were fantastic. A Reverie for atmosphere and options on the menu that I always have trouble reading out loud. Republic of Noodles – One of the top 100 restaurants of Asia. You will find both these places open when all other restaurants are closed in the afternoons or early evening. Infantaria is a great option with good food and Bebinca to die for. I have seen the locals get their cakes and pastries packed from here. Cinnabar is right beside the Acron Arcade, has a variety of options from Burgers to Biryanis and Goan bread. There’s the irresistible Cafe Chocolatti with its chocolate strawberry mousse and other fine pastries. Natural’s Ice- cream near the Calangute beach is awesome, as it is anywhere else in India. I can never have enough of Natural’s Coconut ice-cream. East Meets West and A Reverie have great deserts to follow the meals. There are a couple of Cafe Coffee Day outlets, a Barista outlet in Calangute. There’s a Subway on the Baga road. There are lots of options for vegetarians, but I’ve only tried one. Sharanam Green – This restaurant has more options for Vegetarians than I have seen anywhere in India. Worth checking out. I have never been disappointed with any Shack I have eaten at – Pete’s Shack, St Anthony’s Shack, Shining Star Beach Shack. It is impossible not to love the food with a gentle breeze, looking out at the sea. There are other north Indian restaurants like – Indian Spice and Indian Kitchen which are good as well, if you want to go to a North Indian restaurant in Goa . We once tried the tandoori prawn at Indian Spice and loved it. I have never had a chance to go to J & A’s Little Italy and Le Poisson Rouge, though I have read good things about them. They open only in the evening, and we were always at the beach in the evenings. Did I miss any big ones ? Watching brightly lit floating casino boats on the Mandovi river, and the beautiful sky above, we didn’t mind the order taking too long. Quarterdeck offers the perfect spot to sit and decide the casino or cruise you want to go. Watching people drive into the passenger ferries with their cars, and hearing music from the evening cruises keeps you occupied. I will however, remember Quarterdeck for its Naans – the cheese naan (which had crispy, light brown, cheese), and the Kashmiri Naan – with almonds, cashews and other nuts finely grated and put on top. Ever since I have been ordering Cheese Naans at various restaurants, only to be disappointed every time. Most restaurant’s just stuff the naan with cottage cheese, unlike Quarterdeck which had this awesome crispy layer of cheese on top of the Naan. The Chicken Xacuti and Cafreal were great too, but we couldn’t have enough of the Naans. This was one of the only two restaurants in Goa which we visited twice in our month long stay(other being Au Reverie in North Goa), though mainly because its conveniently located by the river side, for all people going for a cruise. They have good North Indian food too, we saw a lot of people ordering the Kababs and Chinese food as well. Has a lot of seats so you wouldn’t have to wait - which is a big plus is you have been walking all day in Panaji. Oh, and there was a place to let the kids run loose with toys! I’d go back there in a flash for the Naans watching the casino’s and the ferries tug along. Set in an old Goan home, with its authentic Goan cuisine, and an award winning Chef, Viva Panjim was highly recommended. Lonely Planet, Outlook Traveler, Time Goa Guide and Tripadvisor sang its praises. This was one of the two places to go for Goan cuisine– the other being Longuinhos, which was a let down. If the weather is good, I highly recommend walking to it from the Church of our Lady of the Immaculate Conception. You get the feel of passing through an old world, beautiful and forgotten. The architecture and people will keep you interested in the 15 minute walk. See the story below to understand how outrageously helpful the people really are! First, the restaurant. We sat down outside in the street, and experimented with our order. In addition to the Kingfish Curry and Rice, the Rawa Masala Fish, Chicken Stuffed Papad – we ordered Brinjal Chips! Brinjal Chips surprisingly, turned out be absolutely fantastic! The rest of the food was great too – though you might want to request them to make the food extra spicy if that’s how you like it. The foreigners outnumbered the Indians here – which explained the mild spices. We had Bebinca for dessert, which was fantastic and beautiful as always. The chief chef Mrs Linda came outside to talk to us just when I was reading about her. She said “I am so happy to see Indians coming home as well”, and looked like she meant it. We were the only Indians out of the 30 odd people eating there that afternoon. Surprisingly, unlike other great restaurants in Goa, this one was very reasonably priced. So I kept a copy of the bill. The meal for two just cost us Rs 475. I hope to go back to Viva Panjim and try their Xacuti, Vindaloo and Sea Food Platter soon. On our way back, we thought of picking some fruits for our walks. There was a small open shop with beautiful fresh fruits – strawberries, grapes, bananas and more, but empty. We waited for a few minutes and thought of walking away. Just then, there was this lady walking on the other side of the street who came up to us. She said - “I will call the shopkeeper, you guys select the fruits”. Perplexed at buying fruits from a shop from a passerby we hesitatingly started selecting fruits. A guy who was probably eating his lunch, looking at his hands dripping with rice and curry, came out and asked her what she wanted. He said-“Fine” and went back in to finish his lunch. She then said - “Oh I’ll have to disturb him again to ask him the price”. So here’s this guy, who doesn’t care what price his goods are sold, nothing is more important than lunch. And there’s this woman, who would go out of the way to help some tourists, in this heat. That’s Goa for you in a flash – there are people who take a 4 hour afternoon ‘siesta’ and people who would go out of their way to help you. She then shouted again, asking him the price and then told us to keep 60 rupees in his shop. We did that and left, so did the woman! The guy didn’t bother to come out. Sher-e-Punjab – Panjim, Goa - What a surprise! As my mouth waters remembering the extremely soft Paneer and Chicken Tikka with just the right amount of spices in every little bite, I marvel at how we were pretty sure about not going there. Sher-e-Punjab, Panjim was listed as an “Our Pick” by Lonely Planet, Goa which generally put a restaurant to the top of our list. However, it didn’t make much sense eating Punjabi food in Goa. Viva Panjim with its popular Goan cuisine seemed like a better choice. However, that particular day, as I was enjoying the walk down Altinho Hill, admiring the Portuguese architecture, Rubal was ready to kill and eat me, she was that hungry. Her look when I stopped to click another picture made me believe her. Looking forward to the beautiful walks – we had not hired a bike for our two days here. This meant a walk during the middle of the day in the sweltering heat and there weren’t any auto rickshaws or taxis on Altinho hill (at that time of the day). As we reached to the base of the hill, we finally got a rickshaw, and I took out my list of restaurants and maps. I told the driver to take us to Viva Panjim or Horse Shoe, but he gave us a blank look. He said - “Sher-e-Punjab”, and grinned from ear to ear. How often would you get a chance to recommend a Punjabi restaurant to a Punjabi in Goa ? I think we made his day when we said - Yes, take us there. Rubal finally smiled. The restaurant was pretty full, which is always a good sign. The service was fast, and the food delicious. Rubal and I agreed that this was definitely the best Paneer Tikka we ever had. The chicken Tikka was great too and the rates very reasonable. We left and ate Almond Rocher at the nearby Bread n More for desert. Shararti Bhindi and Dancing Chana Baby! This morning Rubal was chuckling reading a message from my Mom - “Shararti Bhindi, Dancing Chana Baby, Murg MatWala, Salad and lots of Love”. 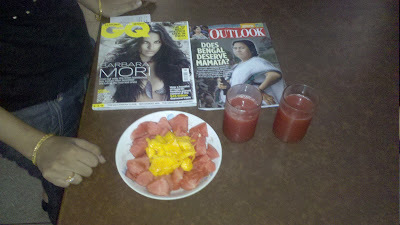 A few days back it was “Egg on Toast, Cheesy Chips, Salad, Shaky Mango, waiting” and “Mango Pulp, Watermelon Juice and more. See you at the same place”. My mom who’s a teacher has her summer holidays, and she likes us to come home for lunch. In addition to admiring her new innovative recipes everyday, we crib about how it is difficult to come home everyday for lunch. So Mom sends these messages every day to make sure we don’t get lazy! The third message being the most common, she sent it early in the mornings inviting us to come home for breakfast on her holidays. Most days the message came in good time as I get up pretty late, and you know how parents get up real early. A few times I noticed how the message came in pretty late – 12.30 AM, 1 AM – which was a shock considering my parents sleep pretty early. The 3 letter word Goa brings about the picture of beaches, amazing food and amazing night life. There is however a corner of Goa where everybody sleeps at around 9 PM. Rated one of top 100 resorts in India as per Outlook Traveler – Wildernest Nature resort looked promising. However, their website was pretty average, so my expectations were low. Rubal was extremely excited about the butterflies, and the waterfall trek so we were definitely going. The resort is on the border of Goa, Karnataka and Maharashtra and has an amazing infinity pool that looks over to the mountains. You can float on the edge of the pool for hours staring at the valleys and the beautiful mountains. Very pretty! They offer multiple treks, we just went on one - the morning trek to the waterfall. It was through the forest, where our guide showed us tons of plants with medicinal and other properties. There were butterflies, lots of them. We saw a snake, and then sat and bounced stones near a waterfall ! The food is predominantly Maharashtrian, but a mix of Goan and Karnataka cuisine. Its definitely worth checking out for its uniqueness – Mula Bhaji, Ukda Bhat, Konkan Fish and something new everyday! Some of my friends tell me that I only tell good things, and that would never make me a good reviewer. So I am going to try and criticize things in my reviews as well. Here goes. If you like to wake up late, that wouldn’t be an option at Wildernest. You would wake up to the sound of birds and animals early every morning. If you think you have had enough of the forest and want to go out to a beach or to the markets – they are all at least an hours drive away. If you don’t like walking too much, you wont appreciate the fact that you have to walk almost a kilometre almost everytime you go back to your room from the restaurant. Finally this being the forest, there are snakes here. The locals though told me they have never had a snake bite in the last 5 years. During the monsoons you can get rates as low as Rs 4000 per night. The rate goes up to about Rs 6000/8000 in normal season(Feb-April) and probably higher in peak season(Dec/Jan). They offer a pickup if you stay for 2 or more days. The rates of the mountain view room are about Rs 1000 higher than the Forest View room. Here’s the view from the mountain view room ! Most people we met at Wildernest agreed that the place was much better than the website, a rare thing. We made more friends in 2 days here than during our vacation, doing treks together, watching snakes, waiting for an event or trying the new cuisine. They have some cultural events every evening, which might be great for foreigners. Definitely a place to visit once in your lifetime. I loved how they have maintained the forest, and at the same time promoted tourism. Ideal Duration – 2-3 Days, probably not for long durations.